She was a tender virgin at Antioch, only fifteen years of age when she was apprehended by the persecutors in 311. Being alone in the house, and understanding that their errand was to carry her before the judge, where her chastity might be in danger, she desired leave of the soldiers to go up stairs and dress herself. 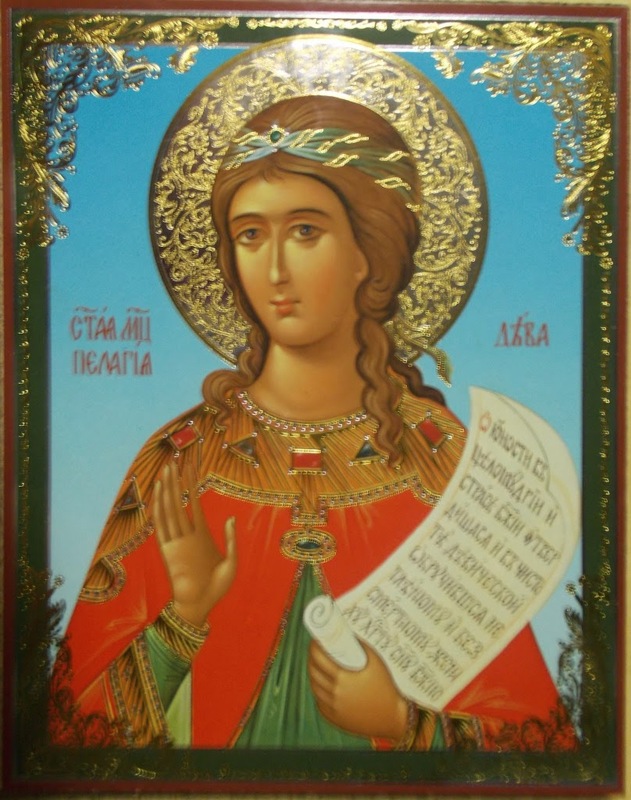 But fearing to be an innocent occasion to others' sin, threw herself from the top of the house, and died on the spot by her fall: in which action, says St. Chrysostom, she had Jesus in her breast inspiring and exhorting her. She probably hoped to escape by that means; and might lawfully expose her life to some danger for the preservation of her chastity; but nothing will ever make it lawful for any one directly to procure his own death. Whoever deliberately lays violent hands upon himself is guilty of a heinous injury against God, the Lord of his life, against the commonwealth, which he robs of a member, and of that comfort and assistance which he owes to it; also against his friends, children, and lastly against himself, both by destroying his corporeal life, and by the spiritual and eternal death of his soul; this crime being usually connected with final impenitence, and eternal enmity with God, and everlasting damnation. Nor can a name be found sufficiently to express the baseness of soul, and utmost excess of pusillanimity, impatience, and cowardice, which suicide implies. Strange that any nation should, by false prejudices, be able so far to extinguish the most evident principles of reason and the voice of nature, as to deem that an action of courage which springs from a total want of that heroic virtue of the soul. The same is to be said of the detestable practice of duels. True fortitude incites and enables a man to bear all manner of affronts, and to undergo all humiliations, dangers, hardships, and torments, for the sake of virtue and duty. What is more contrary to this heroic disposition, what can be imagined more dastardly, than not to be able to put up a petty affront and rather to offend against all laws divine and human, than to brook an injury or bear a misfortune with patience and constancy, than to observe the holy precept of Christ, who declares this to be his favorite commandment, the distinguishing mark of his followers, and the very soul of the divine law! Mention is made of a church at Antioch, and another at Constantinople, which bore the name of this saint in the fifth century.